Here are the cards for my upcoming class at Scrapper's Edge! I am really excited about the McGill Paper Blossom Punches and Paper Shaping Tools. 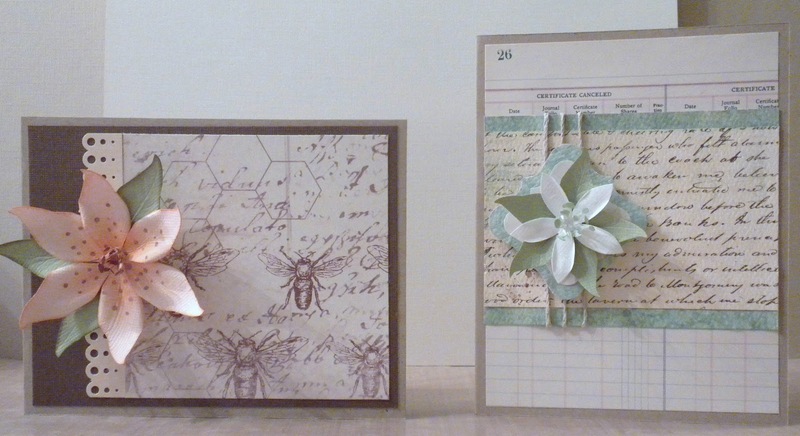 I made the lily and starflower on the cards, and they are surprisingly easy to make! (I made the cards too, lol). So, if you are in the Eureka area on July 19th you should try to make it to my class! Here are the details! Learn how to mold paper to create 3D realistic flowers in just a few easy steps: punch, shape & assemble. Most flowers can be completed in under 20 minutes once you understand the basics. In this class, we will make 2 cards and adorn them with gorgeous hand-molded 3D Lily and Star flowers. The card kits, paper supplies to create the flowers, as well as the inks and Stickles to embellish with will all be provided. You will need to provide your own Paper Blossoms tool kit, molding mat, and Fabritac adhesive, as well as your basic crafting kit. Other fun things to bring to class: quick drying ink to shade your flowers, an ink applicator (like fingertip ink daubers), your favorite color pens (for flower details), and a non-stick craft sheet.